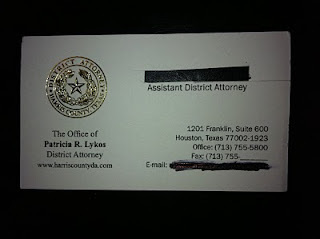 I normally don't do much advertising on this blog for a variety of reasons, but I thought some of my readers who were interested in the historical aspects of the Harris County District Attorney's Office, as well as the Harris County Criminal Justice System in general might be interested in reading former District Attorney Carol Vance's book, Boomtown D.A. I was recently provided a copy by the kind folks over at Whitecaps Media, and I've started reading it. Unfortunately, given my schedule these days, I'm a little behind in my book lists. I have read the first couple of chapters, and it is a very interesting book, especially to me as a former-prosecutor. The salaries and the (lack of) manpower that the office had back in the late 1950s is a stark contrast to what there is today, and it is hard to imagine Harris County ever being so small that that would be manageable. It is kind of like if they were doing a Mad Men version of the D.A. 's Office. Back when I was a brand new felony Two in Judge Ted Poe's court and Caroline Dozier was my chief, Judge Poe got frustrated with the prosecutors and barked out: "Ms. Dozier, I want you, Newman, and the Mullet in my chambers right now." At the time, I thought that Poe had come up with a wildly hysterical and original insult for our then-Number Three (which, I would have completely agreed with the Judge at that point on his description). I laughed about that moment for years. But after reading a bit of Boomtown D.A., I learned that the "Mullet" was what the Three in a court used to be regularly referred to. In the first couple of chapters, that is what makes for such enjoyable reading in the book. I look forward to reading the rest of it as Mr. Vance covers a very transitional time in Harris County. His tenure as a prosecutor would span through the 1960s and 1970s and encompass the period of time of some of Houston's most notorious crimes -- from the Joan Robinson Hill case to Dean Corll & Elmer Wayne Henley & David Brooks. I look forward to finishing reading the book, and if you want to get a copy of it yourself, you can get it from the link to Whitecaps Media (above), or through Amazon.com. (NOTE: The link to Amazon.com also references a book called The Man with the Candy by Jack Olsen, which is also an outstanding book about the Corll/Henley murders. I read it a long time ago, and I highly highly recommend it. Black Ink has a new blog post that you can read here. The post is excellent in its own right. Black Ink's comment at 8:17 a.m. is downright inspiring. Speaking of Lykos Investigations . . .
Have you wrapped up this one you announced yet? It has been over half a year and I'm still waiting on the results of your analysis. In this morning's Houston Chronicle, there is an editorial entitled "Laurels for Lykos". In the editorial, the author of the editorial lauds Lykos from clearing out the DNA backlog (which was underway long before she got there) and for her launching the investigation into the death of Asher Brown (which I mentioned in the post below). The praise that they are heaping on Lykos becomes so frenzied that the author even has to blurt out: "It's hard to imagine Lykos' predecessor, Chuck Rosenthal, concerning himself about such an issue [Asher Brown]. The DA's office has certainly changed, and for the better." Well, the author of that is kind of correct about that, actually. Chuck Rosenthal wouldn't have launched an investigation into Asher Brown's suicide. Because Chuck Rosenthal would have known that there wasn't a crime to investigate. Asher Brown committed suicide because he was being bullied at school. The bullies who picked on him for being small, poor, or gay were despicable beyond imagine. They should be suspended from school. They should have to be known for what they did to that poor little boy for the rest of their lives. But under the laws of the State of Texas and the laws of the United States, they committed no crimes. Under the First Amendment, which protects the rights of the Weak Minded to spew out idiotic opinions (like the Editorial Board of the Chronicle does every day), those nasty children that tormented Asher Brown can say whatever they want and be free of prosecution from the government. And Pat Lykos knows that. She also knows that Asher Brown's death is something that will garner National Media Attention. Announcing that there will be "an investigation" does nothing more than hitch Pat Lykos' bandwagon to Asher's death. There is certainly nothing substantive that a criminal investigation will lead to. Jeff Cohen over at the Chronicle should know better. He's married to a defense attorney. Hell, even Brian Rogers is an attorney. And if you don't believe me that there isn't a charge to file on the bullies who taunted Asher, pick up a copy of the damn Penal Code. What Pat Lykos did by announcing her "investigation" into Asher Brown's death was to stand over the grave of a poor and desperate child and attempt to turn it into a campaign rally. She hijacked a tragedy for her own selfish purposes. It's called exploitation for you morons over at the Chronicle, and you are applauding her for it. The editorial wraps up with this: "Her concern over Asher Brown's tragic suicide, and her decision to examine its causes, is a reminder that, even in Harris County, a DA can be both tough on crime and compassionate." No. Not quite. As a matter of fact, during her tenure, Lykos has proven that she is neither tough on crime nor compassionate. She is just a politician. A politician who wants to ride on the shoulders of a dead 13-year-old into a second term. With the Chronicle cheering her on all the way. By now, I'm sure that you have heard about the tragic story of Asher Brown. He was a 13-year-old eighth grader at Hamilton Middle School out of Cy-Fair who committed suicide last week by shooting himself with his step-father's handgun. The reason for what in the world could cause a 13-year-old to truly believe his young life was no longer one worth living? Apparently, young Asher was taunted mercilessly "for his small size, because he didn't wear designer clothes and because he was Buddhist". It seems that since the Dawn of Time there have always been bullies in one form or another. I'm sure you dealt with them growing up. So did your parents. So did their parents. There never seems to be a shortage of people who hold more power, strength, or popularity than someone less fortunate who elect to use said power, strength, or popularity to abuse. It isn't limited to 8th graders, either. In another highly publicized case this week, 18-year-old Rutgers University student Tyler Clementi committed suicide by jumping off the George Washington Bridge in New York City. The reason for his suicide was, again, bullies picking on him. I think most of us were brought up to have nothing but disdain for those choose to be bullies. We are taught from a young age that bullies are usually people born out of insecurity regarding themselves. How many of us were taught cute little overly-idealistic methods of dealing with bullies when we were kids? "Just ignore them?" or my personal favorite: "Try to be their friend!" The bottom line is when it comes to dealing with bullies that the only truly effective method of dealing with one is to stand up to one. How often do parents preach that to their children anymore? And how many times a day to we bypass the opportunity to do so? How many times a day do we bypass the opportunity, maybe not to stand up for ourselves, but to maybe to stand up for somebody else who is being bullied? It is very easy to cry on TV, hold a solidarity march (which changes nothing), or announce you are going to launch an investigation which will ultimately yield nothing (other than possible charges against the parents). But here again, you are talking about doing too little too late. As lawyers, we have the opportunity to combat bullying more so than most. Prosecutors have the ability to stop some bullies by putting them in prison. Defense attorneys have the ability to stop some bullies by standing up for their clients' rights. Prosecutors have the ability to say they aren't going to follow an arbitrary policy that over-punishes someone for a minor crime. Defense attorneys have the ability to say we'll take it to trial if you try. But there is always more that can be done. Moments like this make me think of my friend, Mark Bennett. Mark, to be sure, often beats to the tune of his own drum, and has never been shy about espousing an unpopular opinion. But the guy has never been bullied out of his opinion, and he's never been shy about standing up against people he thinks are being bullies, either. For that, I admire him. Even when we disagree. When you ignore it, you become nothing more than a coward who condones it. When you stand against it, you'll often find many will stand beside you. I know this is probably seeming kind of rambling, but what happened to Asher Brown and Tyler Clementi has got me kind of worked up today, I suppose. So, I guess I'd say that my message today to bullies would be "grow up and knock it off". And to the rest of us, I'd say we've got a duty to stop it where we can, and not be afraid of being bullied ourselves. To paraphrase The Once and Future King, it should never be Might that makes Right, but Right which makes Might. Nobody should ever die over bullying. Certainly not teenagers like Asher and Tyler.